Nokia announced their new flagship Windows Phone 8 smartphones Lumia 920 and Lumia 820 earlier this month but kept mum on their pricing and availability. But now Nokia Germany has officially announced the pricing, with Lumia 920 priced at 649 euros (approx $836) and Lumia 820 priced at 499 euros (approx $643). The press release on the Nokia Germany website states that the new Lumia models will be made available to users in November. Even Nokia Italy has revealed the prices, users will have to shed $772 for Lumia 920 and $643 for Lumia 820. Meanwhile guys at TheVerge have reported that, Nokia's Russian unit has started taking pre-orders for the new Lumia devices and Lumia 920 is priced at US $801 and Lumia 820 is priced at US $640 for pre-order. 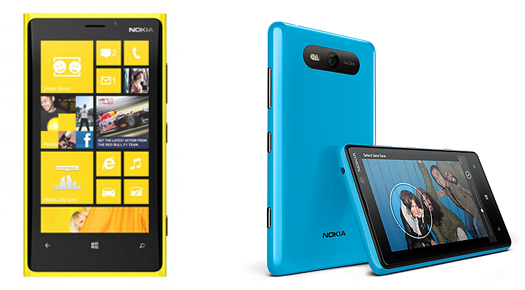 Lumia 920 and 820 are available in many colors including red, white and black initially. There has been no updates about the availability of the new Lumia devices in other markets including India. We will keep you updated once there is an official word from Nokia India about the release date and pricing here.